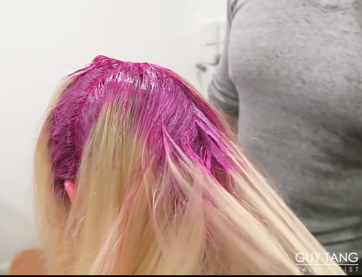 Now that we have pretty much seen hair dyed every color under the rainbow, you may wonder what can seem daring these days. That said, I think we can all agree that this glow-in-the-dark hair first shown on Marie Claire falls in the camp of being out there. Dubbed Phoenix Hair, it was created by celebrity hairstylist Guy Tang, who is particularly known for his creative use of color. The dye itself includes a mix of neon orange, red, yellow and purple from Kenra Professionals Color Creative Neon Collection. The result is amazing…. To also see a video showing Guy Tang’s process for creating this masterpiece, check out this from Marie Claire.